Every active computer user stumbles upon a pile of dupes in Downloads folder every once in awhile. There is a big chance each user also notices similar files being stored in different folders or even on different disks. Of course the duplicates can be deleted manually, but why bother if there are so many applications that were created for this exact task? This handy tool quickly and thoroughly scans filenames and contents on your computer. dupeGuru’s Music mode allows scanning tags and shows music-specific information in the duplicate results window. Picture mode allows finding pictures that are similar, but not exactly the same. The application safe is customizable. dupeGuru not only deletes files, but can rename and move them as you need. Smart system protects from deleting files you didn’t mean to remove from computer. dupeGuru supports English, French, German, Chinese (Simplified), Czech, Italian, Armenian, Russian, Ukrainian, Brazilian, Vietnamese. Popular OS X native application that is capable of locating duplicates even in remote corners of your system. 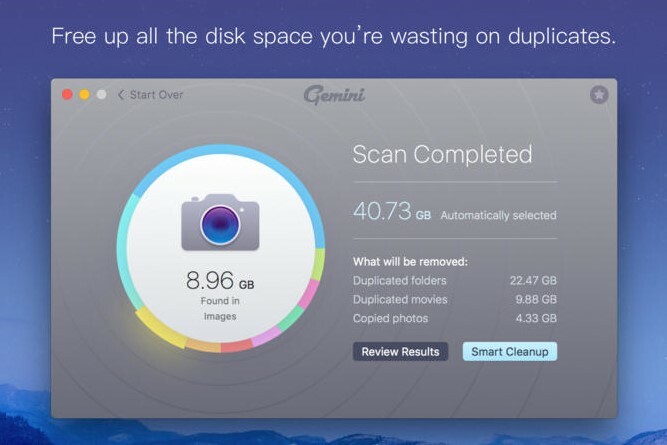 Gemini shows user the differences between the found duplicate files. It also finds copies in your Camera Roll and iTunes library — not a single even slightly duplicate-suspicious file will get past Gemini. The application easily tells copies from originals and knows which of them to keep intact. Gemini has a smart ability of remembering the files you choose to keep and the ones you delete, then selecting duplicates the way you would. Advanced search application that is also able to delete duplicates from your computer. It allows searching by such filters as file attributes, last accessed/created/modified time, file content, file size, etc. Such flexible search provides much more accurate results in comparison to the results received after regular Windows search. SearchMyFiles will be of help not only on the duplicates search task, but any other time you need to find something in the depths of your hard drive. Even though AllDup is free, it can do a lot. The application finds, copies, moves and deletes the duplicates, including repeated audio files that have different tags. Moreover, AllDup has a pretty flexible search. Built-in file viewer provides the ability to look through duplicate files and pick the needed action for each one. This application finds duplicate files on your computer effectively and fast. It allows searching duplicates not only on a hard disk drive, but also on a local area network. Duplicate File Finder processes audio and images, being able to compare both tags and contents. Preview option provides an opportunity to make sure what files should be deleted before removing them forever. The only real con the application has is a limited access to the most of the features on free version.